a nostalgic journey through 20 years of C=64 SID music. requires SDL, OpenGL 1.0 and a rather fast processor (~2GHz). press space to enter "non-realtime" graphics mode (i.e. The tunes are classics, and a good choice collection. But the code is so bad it hurts. try to disable "force vsync" (or similar) in your driver config. lithis: Why yes, you need that nowadays. In fact, if you open a C-64 nowadays you will see that The Shadow Government has replaced the internals with a 2.6GHz P4 system in our collectively induced sleeps, so there is no escape! a screen shot of the very same script engine which I have just ported to amiga 68040+fpu. frisch aus der forschung: machen sie es klar! btw. 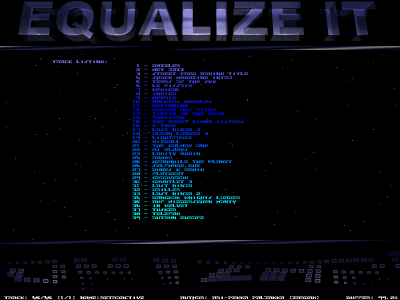 the latest version of the win32 runtime suitable for that equalize.tkx file can be d/l here. 2GHz CPU required for a 6502 emulator and a starfield? You gotta be kidding. Wouldn't have been to hard to include a batch file, right? Also bwuahaha ... 100% CPU load on a AMD64 3500+ ... I wish stuff like stargazer or debris was coded like that, so we'd require 10THz machines to run them. so, no need for shell haxx0ring, just click the .exe. the load very much depends on which tune is played. I used a (by now) very old version of sidplay, current ones are probably better/less CPU intensive. however, there's more important stuff to do than improving this sucker so I leave it as it is. Cool presentation of some SID great tunes. Could you do the same with the best Art of Noise tunes, please? Shockwav3: You are right, it also happens on my current PC. Somehow I must have fixed it in the meantime. Here's a newer release (01Jan2010), load is 4% on my 2,8GHz CPU. so here is this update. should be in the ~5% ballpark now (depending on the tune being played. some take up to 30%). page created in 0.018082 seconds with 15 queries.